You gotta have a bike at Burning Man, but how to get it there? Bike racks come in a about a thousand shapes and some work better than others. 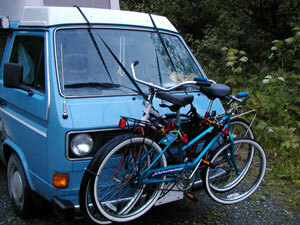 Putting a bike on a Westy can be a problem, though. Roof-top racks impede the use of the poptop and if you're like us, you get into the back liftgate forty times a day, so that doesn't work. There are some really nice trailer hitch mounted racks out there, but trailer hitches aren't exactly common on a 67 horsepower van. So, here's a solution that's worked for us. We bought an inexpensive bike rack from Wal-mart for less than $30. It was designed to go on the back of an SUV or the trunk lid of a sedan. We mounted it on the front of the van using the tie-down points in the luggage rack on the roof and the bumper. We carried two bikes like this from Ohio to Fairbanks and down to Nevada; yep, on the Alaska Highway and worse. It made us drive a little more carefully through the bumps, but was reasonably stable through all but the worst. One word of caution, however, keep the rack and the front of the van clean when doing this. I'm sure the rack would damage the paint if you drove far with grunge under it. Other issues: yes, you have to look around the handlebars and seats of the bikes. You totally forget they're there after a few hundred (thousand? It all kinda runs together for us) miles. The other issue is that the headlights are partially blocked by the bikes. This didn't cause a problem for us on the highway or in town, but driving down back roads, looking for a side road to pull off to camp on after dark needs the extra light sometimes.